Time to head into part two of the 2016 Mega Rundown. Yes, we did A to G yesterday, and today we do G to Z. There’s a lot of G’s around, OK? More photos to scroll by until you pass out from the pretty colors. Disclaimer: Games are listed by the booth in which I found them. This could be the publisher, distributor, or maybe someone stopped to rest and set down their game. Any mistakes are my own, treat finding mistakes a game and post below to win fabulous imaginary prizes. Oh, and these games are all fairly new to me, they may be old hat to you. Want me to be more current? I’d be happy to take your newest, hottest games off your hands. 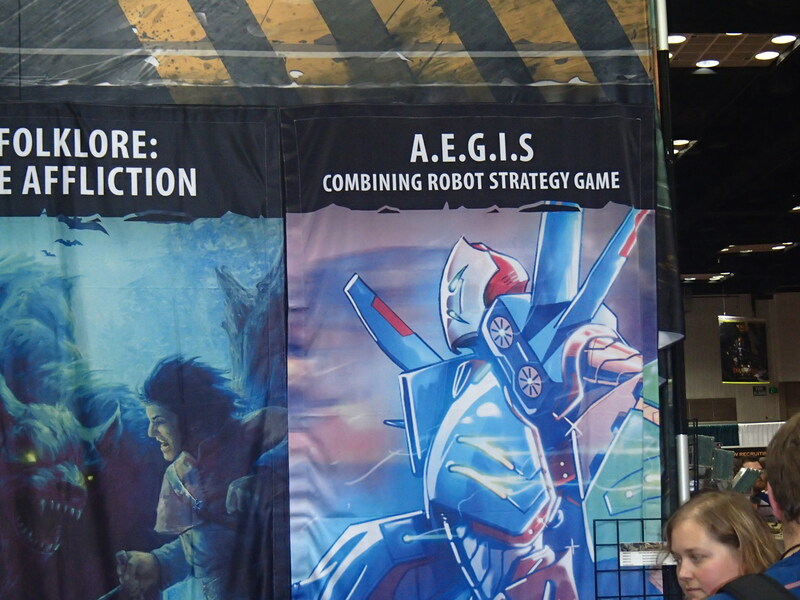 Despite their standard naming scheme, Gamelyn Games’ booth wasn’t all that tiny. They were giving away a free die, so maybe it was epic for some. 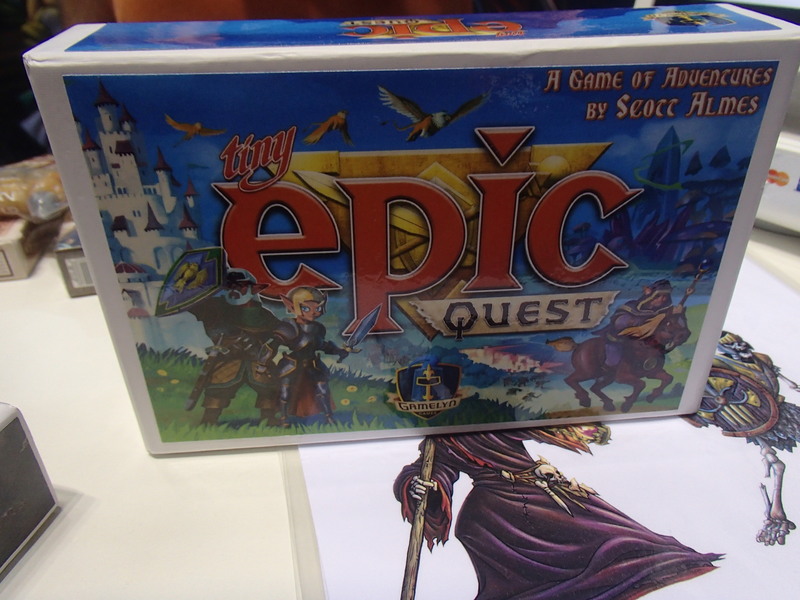 Regardless, there were several Tiny Epics on offer. 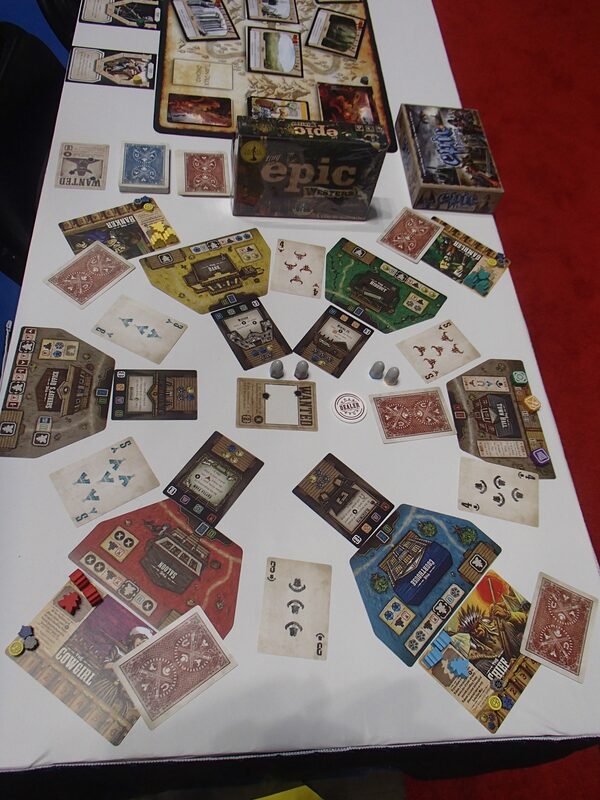 Tiny Epic Western was on display. It should be available in stores around October. The game is six rounds long. It primarily worker placement (start with 2, you can earn a 3rd) and has three main resourses: Force, Law, and Money. Since it is a western, you can duel for a worker spot, adding a card from your hand to help your attack. Locations have three benefits: One for occupying the spot, one if you buy the building at the location, and one if you manage to win the “poker hand” for the spot at the end of the round (you have a hole card and you include the two cards on either side of the location – there is a card between each location.) Duriing the game players can buy shares in one of three industries. At the end of the round there is a poker round at the Town Hall to determine player order. The winner also gets to choose to advance the value of one of the three industries. The majority owner of an industry is paid out victory points at the end of the game. Sentinels of the Multiverse is heading into its final rounds. 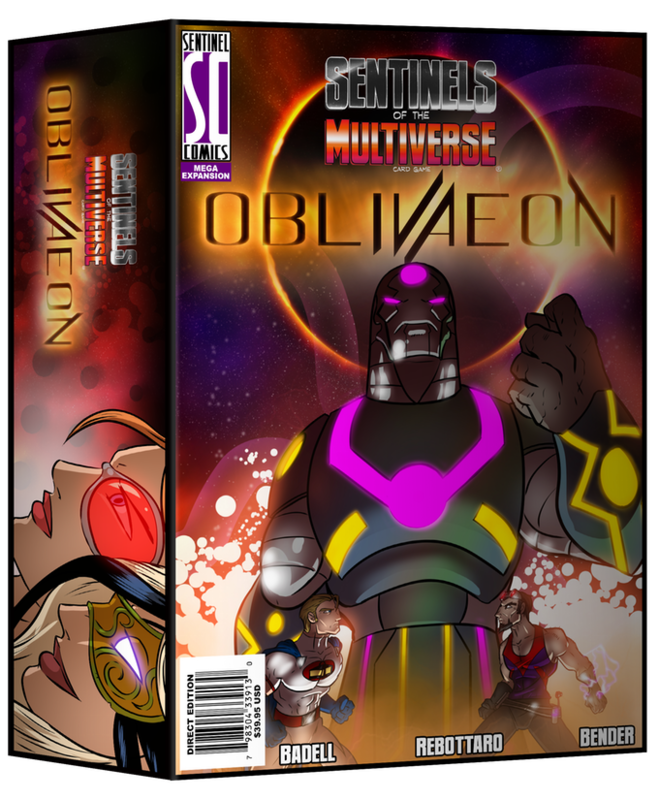 The last expansion, Oblivaeon should come out early next year. Note, this does NOT mean the game is going out of print. The base game and expansions should remain in print for the foreseeable future. However, the game is going to be considered complete (and not one of those Dominion-esque things where there are expansions after the last expansion.) Since there will no longer be any new heroes, Greater Than Games is able to offer complete sets of Hero cards. One option is to get every hero ever made in a special foil card in the 5th Anniversary Foil Hero Collection or go for the pack of every variant card ever made in the Complete Hero Variant Collection. Previous promos will retain their uniqueness as the new cards will have art specially made for the new collections. All the newest stuff should come out in early 2017. I asked about the Sentinels based role playing game mentioned in whispers at last year’s GenCon, but with all the other projects humming along it seems like it is currently on hiatus. Hope is there to get it out some time in 2017, but even that isn’t a firm date. New Bedford has been out to backers for a little while but it should show up in stores October-ish. 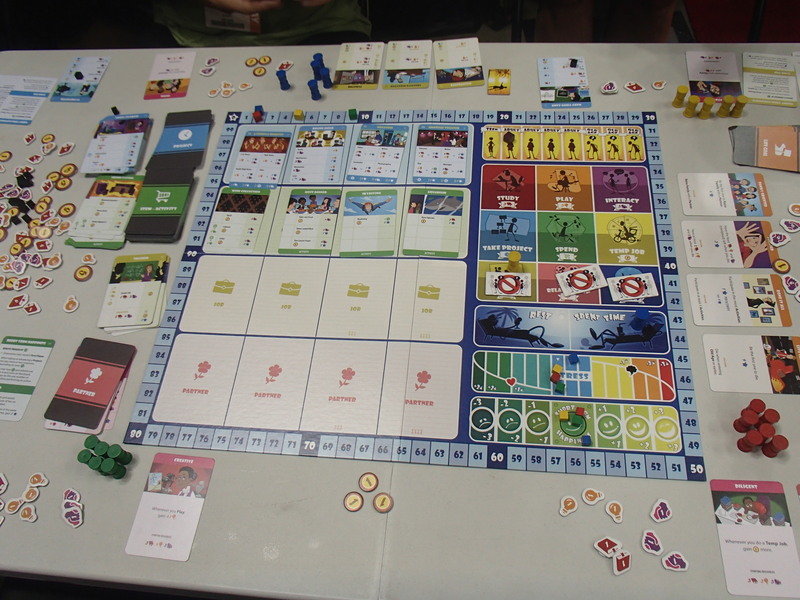 Its a worker placement game where players either build up buildings in the town or head out into the waters to go whaling. It takes more work to head further out to sea, but you have a better chance to catch them. Sometimes workers can share placement locations, but the first one to the spot gets a better deal. The game allows players options for pursuing victory, as specializing in port, at sea, or a combination all possible winning strategies. The New Bedford: Rising Tide expansion is basically all the Kickstarter stretch goals rolled into one. It adds a 5th player and a ship’s log expansion option that adds just a flavor of additional randomness to the game. It should also be out October-ish. Fate of the Elder Gods runs with the Cthulhu theme of the month. Players are an Elder God and trying to control and place cultists of your own faction. 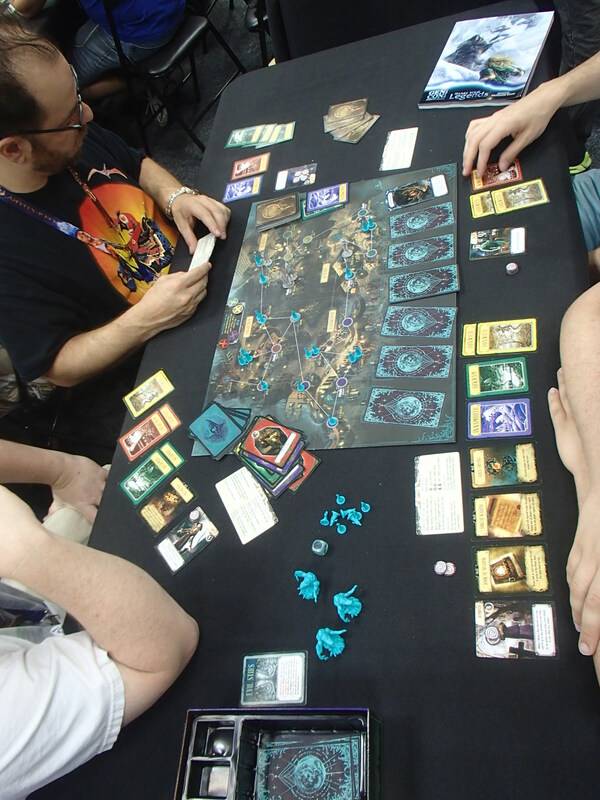 On a turn, a player will play a spell card to move their God figure to another location on the board. That allows them to add a cultist and a (neutral) investigator to the board. If 3 investigators end up in a location they will go into your headquarters. If you ever get more than 5 in your base, dice are rolled and you will lose cultists to the central Abyss location (they need to be retrieved again from there before they can be used for anything else.) Here’s where the game gets interesting (or tricky.) When moving, a player plays a spell card of the color of the location they’re headed. However, that spell card is left at their figures previous location. Thus, locations slowly accumulate different colored spell cards. Now, if you can manage to land on a location with the right sorts of spell cards (colors, etc…) you can “spend” them to cast an actual spell that do lots of weird (and powerful) things. In my mind, I filed it away as something mildly akin to the mancala of Trajan, only everyone is using it at the same time. I was more interested in A.E.G.I.S. : Combining Robot Strategy Game which should be appearing on Kickstarter soon. 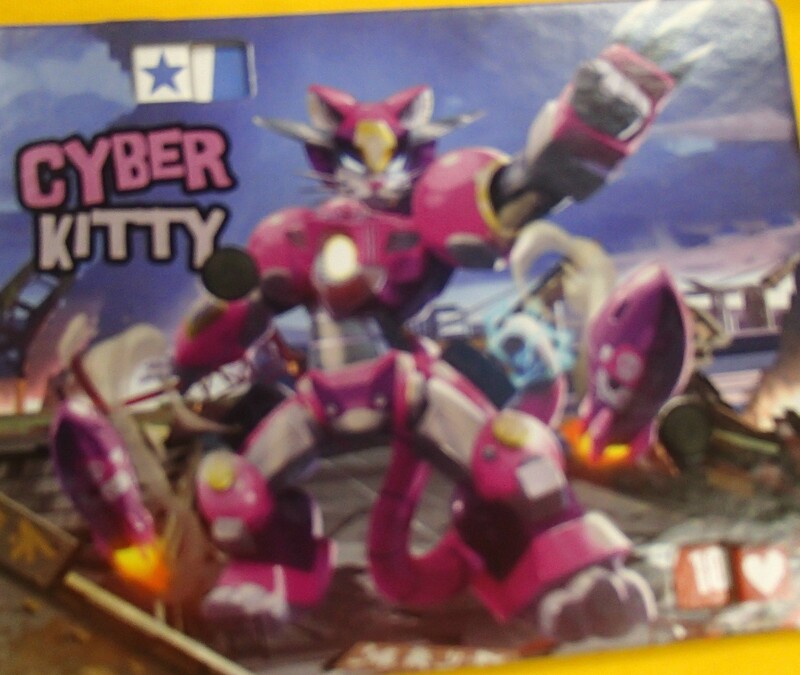 In a team vs team battle, players first draft their team of robots and then pit them against each other on the board. The management of energy amongst your robots will be a key part of the battle. The “cool” factor of the game kicks into high gear because various robots can also combine on the battlefield to make an uber-robot. Whoot! Iello was showing off the reprint of their golden title, King of Tokyo. 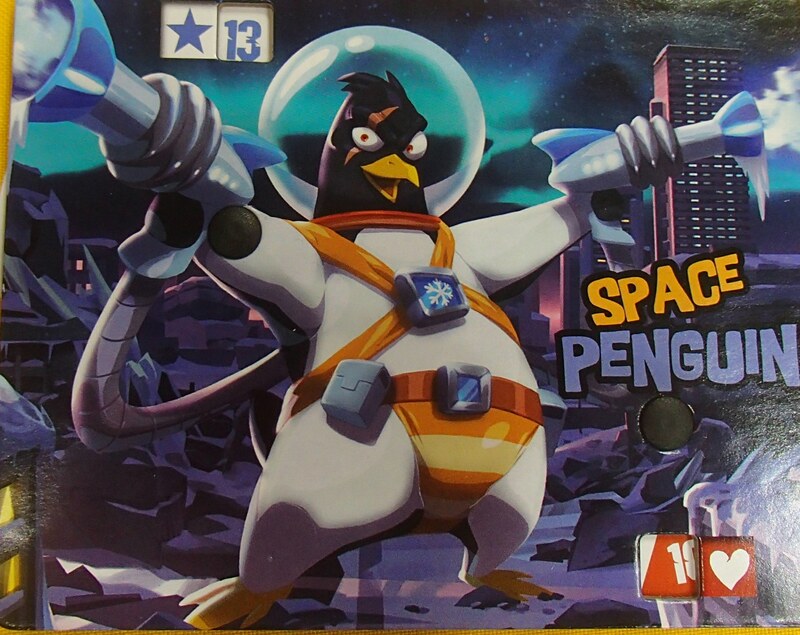 Not much has changed although the game now has the space penguin figure included and the giant bunny is now a kitty (don’t ask, some lawyer thing.) Think of it as King of Tokyo 2.0. Another of those “hot titles” was Apocrypha. In my mind, it has a vague (the designers would probably argue very vague) similarity to the Pathfinder Adventure Card game. 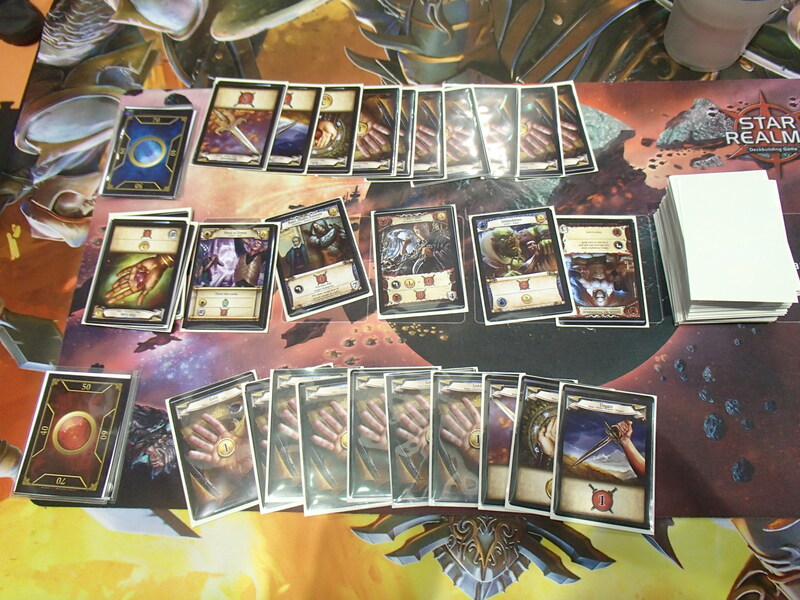 Players have characters which are decks of cards and the default would be to fight against a deck of cards in a cooperative battle. However, the game can also be played as a full-on role playing game complete with a GM. The game is set in the modern day (actually THE day… the day in the game is always the day on the calendar so there may be a card that says “if today is St. Patrick’s day, do this…”) There are invisible monsters around but the players (called “saints”) are the few who can see them. The problem is that players do not remember who they are. 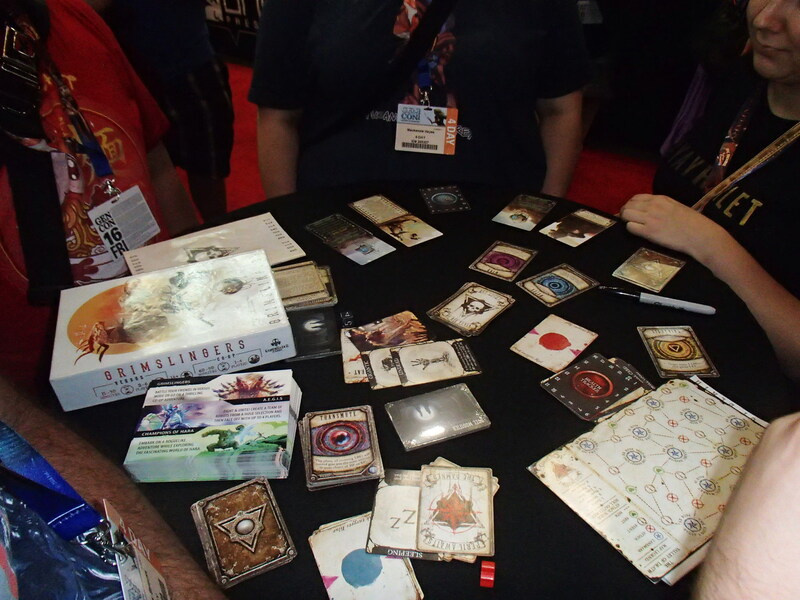 Players start the game with a character card with basic abilities and gain abilities as they slowly “discover themselves.” (The text behind these abilities written by a cadre of well known authors, and that text was then used to create the mechanics for the abilities.) Some memories are positive, some give negative effects. This ends up with characters being more powerful as time goes on but they also become more erratic with lower lows. This creates an interesting situation. New players start rather stable and have very reliable powers. More advanced players will have powerful abilities, but can also have their negative abilities pop up and utterly fail at things. Thus, a brand new player can join in with an advanced group and be welcomed as a stable rock in the sea of unreliability. A full character consists of their deck of cards plus a “halo” which is thier special character abilities and “fragments” which provide more abilities. (One’s character and fragments should be able to fit into a 9 card card binder sleeve.) The game is a beast of a card game with 1400 different cards (can you say lots of art?) as part of 99 missions and 10 total chapters that each focus on a different enemy or story. The missions can be done in any order but their results can affect missions played later. I’m quite interested but gamers should be aware that the game is roughly PG-13. There isn’t any swearing on cards, but there are a fair number of in-jokes and easter eggs that would be appreciated by an adult. The plan is for the game to come out by the end of 2016. 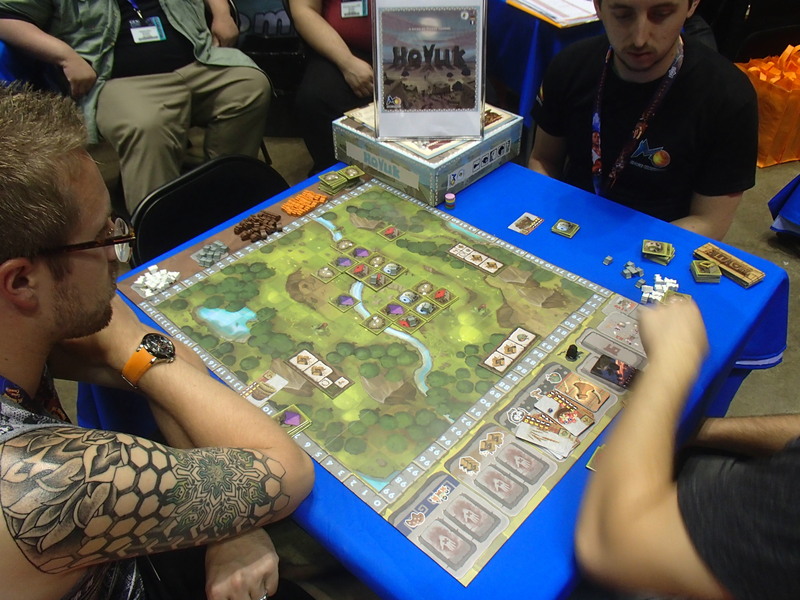 Hoyuk is a 2-5 player game where players are building up blocks of houses. It reminded me of Tigris and Euphrates in that players try to claim majorities in these blocks but the blocks in Hoyuk cannot be joined by gameplay. 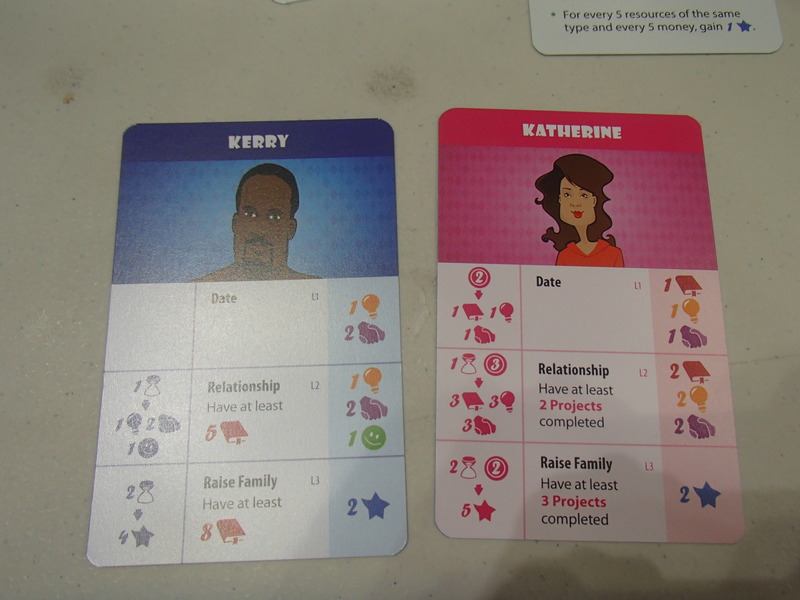 Players gain cards based on majorities. The cards are dealt out at random but they are chosen from a face-up tableau. These cards can be collected into sets to score victory points or they can be used to play stuff onto the board. Each housing block provides cards (rather than one overall majority.) Players can upgrade houses into two story affairs which helps with tiebreakers in that block, but that’s also giving up a play elsewhere. The game ends when someone plays their last tile. The game has a flexible length as the number of tiles or number of available buildings can be adjusted. 12 Realms: Dungeonland is a sequel to 12 Realms, set in the same fairy tale world. It’s kickstarter will open on October 8th and the game should be out about a year later. Here the game is a full on dungeon crawl (a Descent+.) One can play it in campaign mode over multiple game sessions or run an Epic Quest which runs as one long game that contains the full arc of play. Unlike Descent, dungeons are randomly generated and should provide new and interesting encounters for each play. Mayfair had a huge presence as usual, with plenty of play area (in the dealer hall and elsewhere) as well as hefty involvement with family gaming and donations to the local GenCon charity. 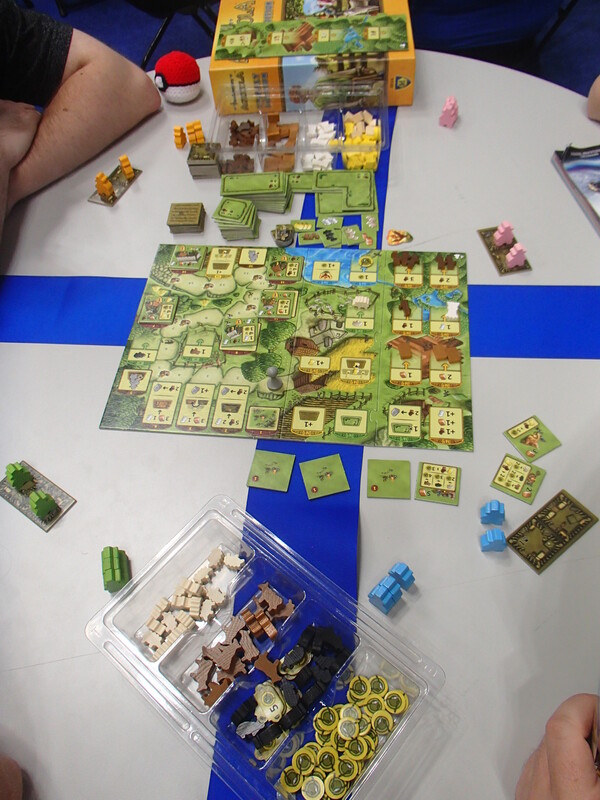 There were not many new games around that I found of interest except for the Agricola Family Edition and Costa Rica. The Agricola Family Edition makes the game simpler in several ways. Players no longer have hands of cards for upgrades (a few are simply tiles that can be purchased off the board, with more complex ones appearing later in the game.) Vegetables and Stone have been eliminated so that’s two fewer resources to track. The actions now appear in a set order (no more randomness) and the extra people action doesn’t even come out until turn 5. Scoring is a bit simpler, too. People are 3 points each, every tile (other than wooden houses) is worth 1 point, and everything on a tile (grain, animals) are worth one point as well. Costa Rica was getting good press so I wanted to try it out. 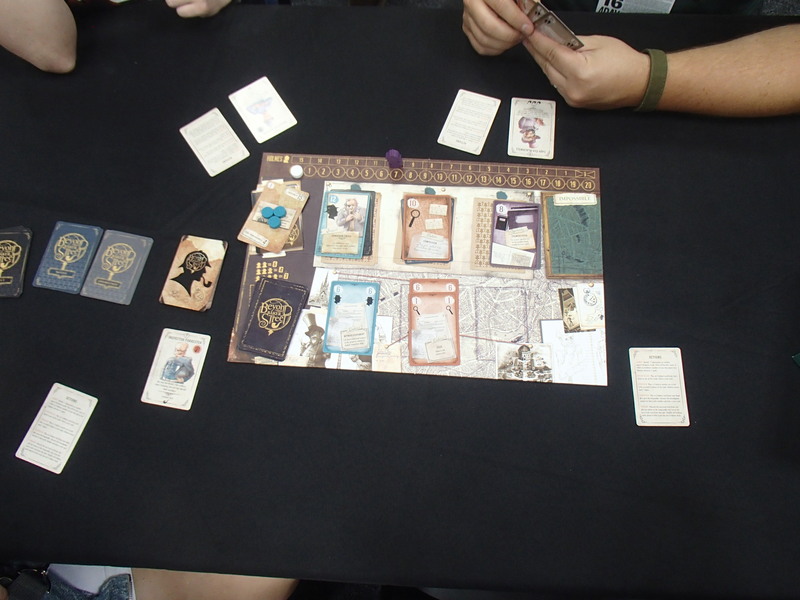 It was such a quick-playing game that it was one of the few games I played to completion at the convention. A large hexagon is made out of small hexagonal tiles. 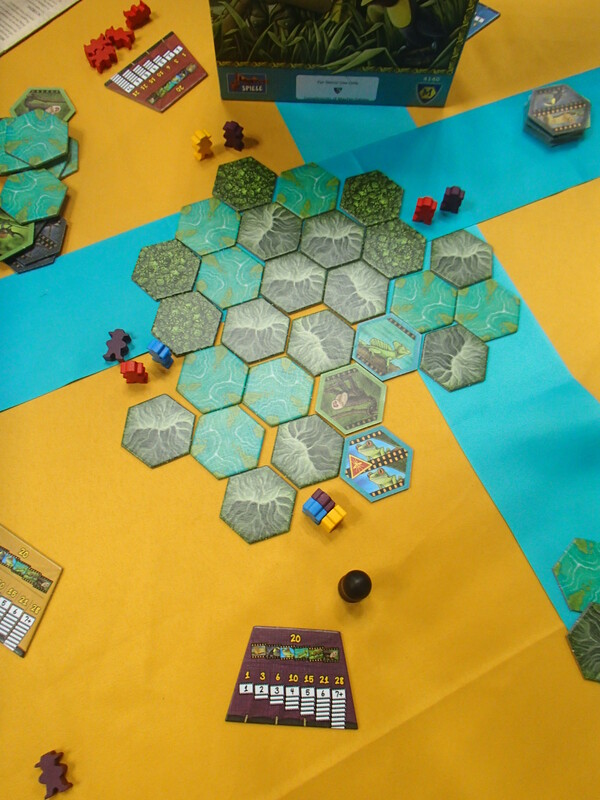 Players line up their explorers at the corners of the large hexagon. On one’s turn, a player flips up a tile next to one of their explorers. They may take that tile or offer it to everyone else. If no one wants it, the active player may then flip up a second tile adjacent to the first (sort of “exploring” into the board.) Players have the option of taking all the flipped up tiles or the exploration continues. Tiles have pictures of one or two animals on the back. Players try to collect sets of animals (up to 7 of a kind to score the max for that animal) as well as get one of each type of animal. However, some tiles have a “danger” symbol and if a second danger tile is revealed in an exploration, the active player is forced to quit but they get all the non-danger tiles that were revealed. The tiles are labeled according to terrain (swamp, hills, jungle, etc..) with some terrain (hills) containing more danger symbols. When an exploration is finished, all the explorer figures that were part of the exploration are moved up to the location of the last tile flipped. While the rules are pretty simple, there is some strategy to be had. One can explore such that figures in other locations are cut off from the main board area. It is also great if one can manage to get their explorer figure by itself so that they can go crazy exploring tiles with no fear of someone chickening out and taking all the exposed tiles. Sometimes, a booth is just empty of customers and you’re curious what’s there on offer. If think I can get a quick explanation and hop out I’ll give it a spin. Such was the case for Nippon Entertainment Content Organization (love that name) and their title, Twelve Heroes. The game looks like a fairly standard column vs column affair. 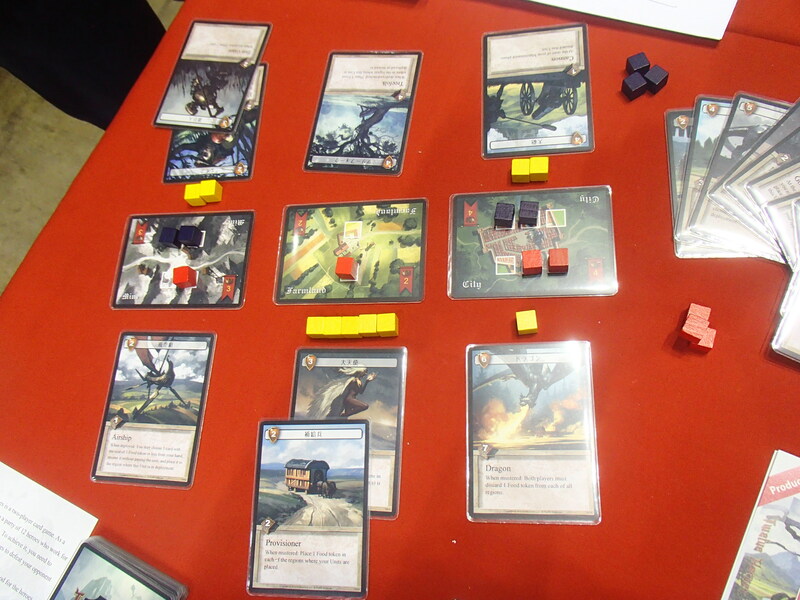 There are three bases and players place their cards on either side of the bases as they vie for control. One needs to have higher value cards (typically heroes and monsters) on their side to claim a victory. Each base card has one or more spaces on each side. Win a victory and you get to place one of your cubes on the base. Claim a victory after filling the spaces on your side and you get the base (and associated victory points.) OK, now here is what I found unique: your cards need food. Yes, you have to find ways to feed your cards while they’re on the front lines. If they have no food, they go away. I think you might get one food or something, but not nearly enough to supply an army. However, you can bring in two food from your own supply when you place a creature onto the line. Thus, new cards coming into the battle bring in food. Also, when you move a creature along the line (from one base fight to and adjacent one) you can also bring food along. From my basic understanding of the game, it seems clear that managing one’s food is at least as important and figuring out where to put your cards. I had hoped to converse with some folks at Steve Jackson Games about the upcoming (at some point) Car Wars 6th edition. But due to some snafus didn’t manage to meet up with the Car Wars guy. However, here’s some info I recieved off their recent announcements. They were hoping for a summer release, but it’s been pushed back until some time in 2017 so they can have the base game and a few expansions in the pipeline when it releases. The game rules are entirely reworked, as is hoped (yet again) to be a faster game to learn and play. The game will release in three versions: a base game (4 player), a Wastelands starter (2 player) and an Arenas starter (2 player) so buying all three allows gaming with eight players. It will be at the HO scale so any minis/trucks at that scale will work for the game. An anthology of stories will also be released (12 stories, one for each faction in the game) on kickstarter just before the kickstarter for the Car Wars game itself. 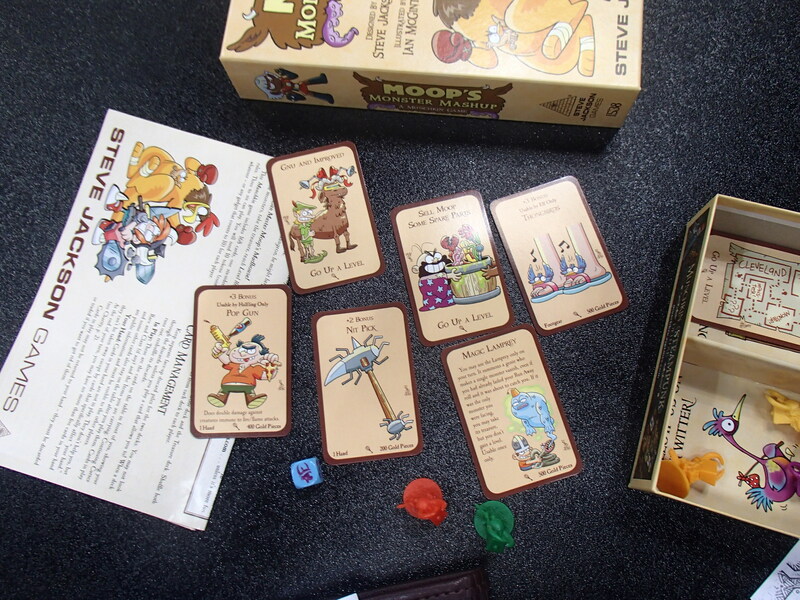 Moop’s Monster Mashup is another Munchkin game, but with a new artist Ian McGinty. If anything it is Munchkin even a bit “sillier” and may be targeted just a tad younger (7 maybe?) Yes, if you like Munchkin you can combine any of the other sets with this one. Hey, I do like the new art. 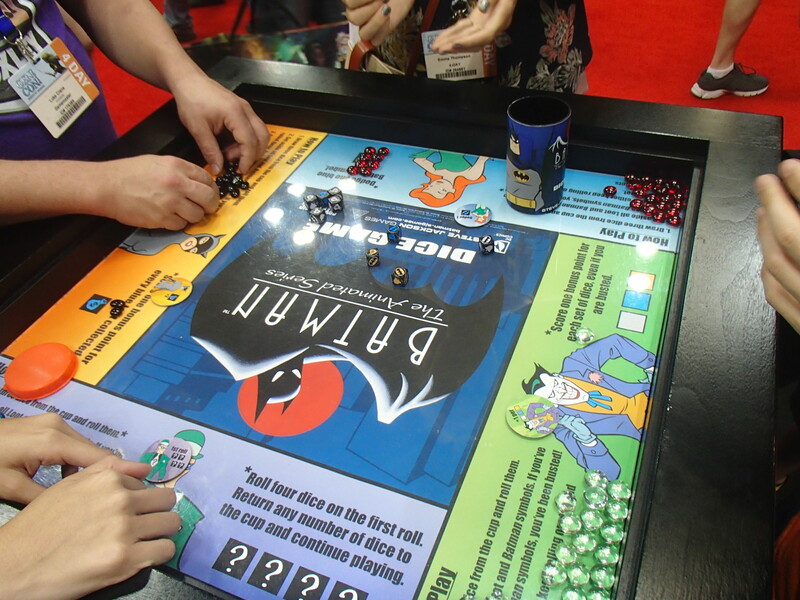 Batman: The Animated Series Dice Game is a dice game, and it has Batman. You’re a villain and get to roll three colors of dice to try to collect as much loot as possible. Roll three dice and set aside loot to claim it but get a Batman and you have to set it aside. Three Batmans and you bust. There is also a bell (alarm) symbol which means that die must be rerolled if you reroll anything (important as the various colored dice have different percentages.) Each time you roll you have to roll three more dice (which can include bells.) Each player is a villain (Catwoman, Joker, etc…) and has a special power to mess with the results. I’m old enough to have watched Bill and Ted in college and was a fan of its banal stupidity. (Keanu Reeves should get some award for his amazing ability to play “dazed and confused” characters.) The two high school reprobates are back in Bill and Ted’s Excellent Boardgame. Everyone (yes, each player is from an alternate timeline) plays as Bill and Ted and are trying to collect historical figures on a square grid. You program your movement, steering right and left using 2 cards at a time. (You move both cards on your turn.) Every historical person you collect adds an addition movement event at the start of your turn (before your two cards kick in.) Thus, as time goes on you have quite a chain of movement kicking in. Thankfully, the board does “wrap around” so you never have to fall off. While all this is going on, you also need to avoid the two “villains” – the knight and Billy the Kid – which are moved whenever specific player movement cards appear. 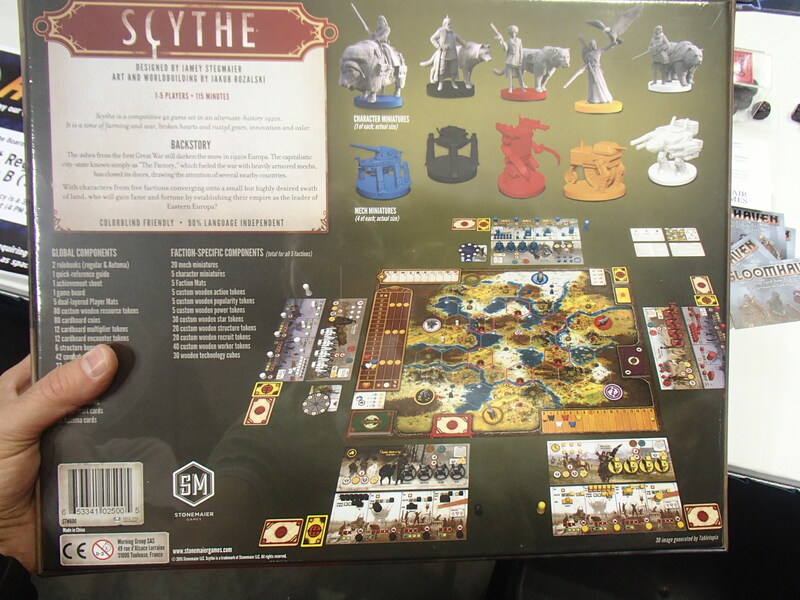 Another of those single-title publishers that was hot at the game was Stonemaier with Scythe. I don’t think there’s been this much fuss about a game with farming since Agricola. The booth had none on display although a couple games were set up somewhere deep in one of the nearby hotel conference rooms. It is actually a 4X game set in the 1920s that involves Mecha. 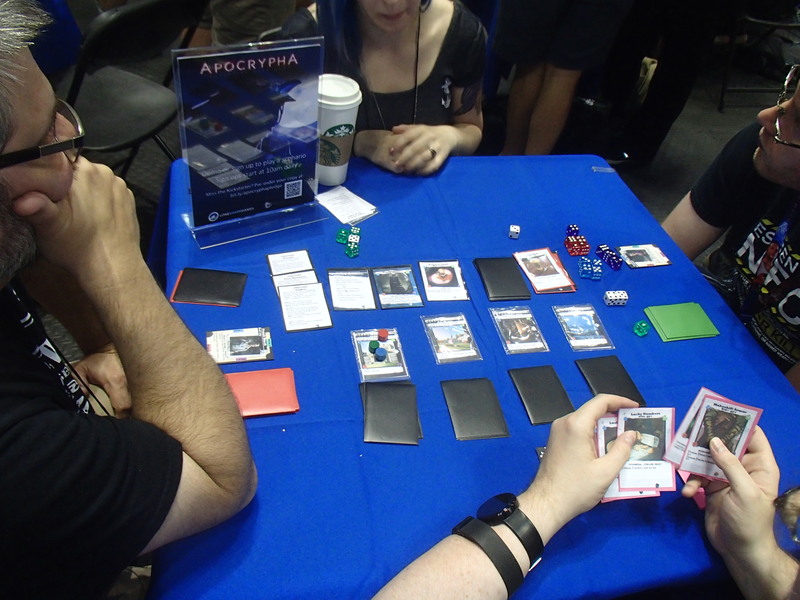 Players start in asymmetric situations and have hidden objective cards, but players still have a variety of ways to pursue their goals. Players need 6 victory points to win the game. These can be won through battles (maximum of 2VPs), deploying all four of one’s mechs, and accomplishing a hidden objective. Players conquer territory, enlist recruits, gather resources, build structures, etc.. Encounter cards provide a bit of randomness but can typically be overcome in several possible ways – combat is not luck based. There are several engine-building options including upgrading one’s actions and abilities. Supposedly the game is fast to play and while player conflict can happen there isn’t any elimination. What intrigues me is that one can play the solo scenario multiplayer for a co-op experience. I somehow had this vague feeling of playing “Life” as I took a look at The Pursuit of Happiness. However, this is a full-on worker placement game with a theme I find completely hilarious. Rounds of the game are associated with stages of life. Players start out as teenagers, work through middle age, and then hit old age at the end. (You have fewer options your first year and in later years some disadvantages kick in you need to overcome.) Players manage their time (worker markers) by spending them on various options. There are four resources in the game: Books (learning), Lightbulbs (creativity? ), Handshakes (social interaction), and cash (to buy items or activities.) Items grant players new abilities and can be upgraded for better abilities. However, upgraded items also have an upkeep cost. Players are trying to take over the local Thieves Market in the game of that name. The idea is to divide the loot to make everyone happy and then sell it off in the market. All the dice are rolled in the middle and the first player takes as many as they want. The second player can take as many as they want from the middle OR take all of the first player’s dice but must put at least one back in the middle (rerolled) and keep at least one. Play goes around the table until everyone ends up with something (ie. if one’s dice are stolen they get a chance to steal some of them back or take something else…) Once everyone has dice they are used to buy cards (or gold which can be used as wildcard symbols in later rounds.) 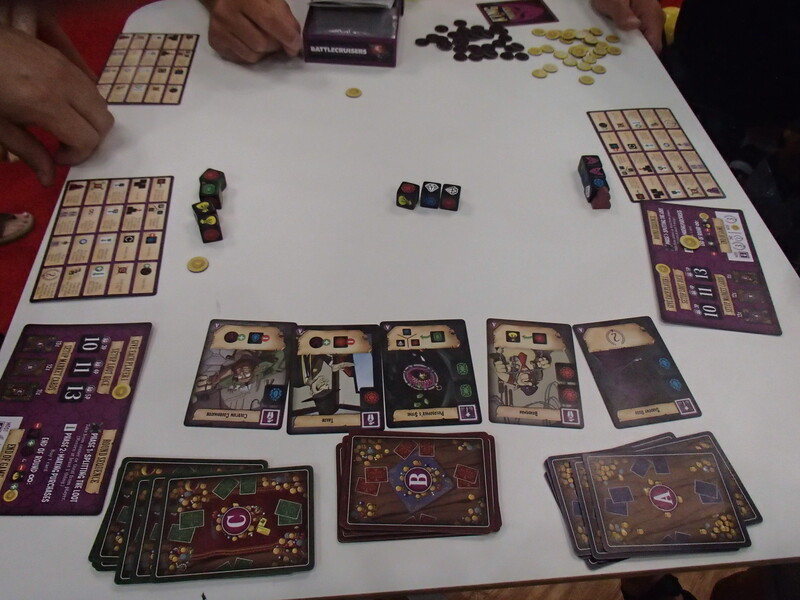 Cards allow players to manipulate the dice in future rounds. Whoever has the most gold at the end of the game gets 3 points and whoever has the most henchmen cards scores 3 points. Some cards are worth points and there are infamy tokens which grant 1 point as well as some ongoing benefits. Legends of Andor: Journey to the North continues the game as a large expansion. It adds in a double sided board as large as the original game. Andor has been asked for aid from somewhere across the sea and players need to fight across the ocean to get there. Along the way players have to deal with storms, islands, new water-esque monsters, etc… There aren’t any new heroes, but plenty of things for the previous ones to do and to fight. It should be out soon, hopefully September (2016). 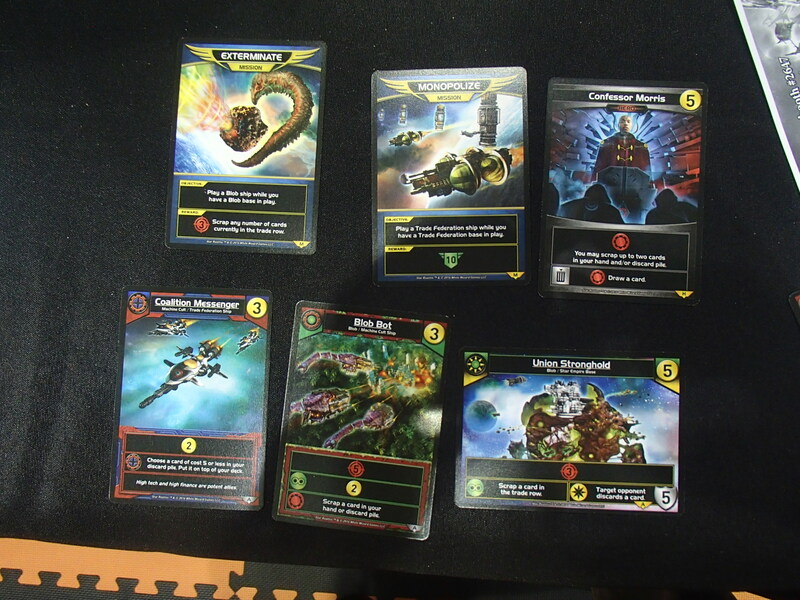 Star Realms has another 4 pack expansion entitled Star Realms: United. As before, each pack has a specific set of cards so purchasing one of each of the four gives you all the cards needed. The Assault and Command packs add in multi-faction cards (two-color, if you will.) Missions contains a set of 12 cards with alternate winning conditions. 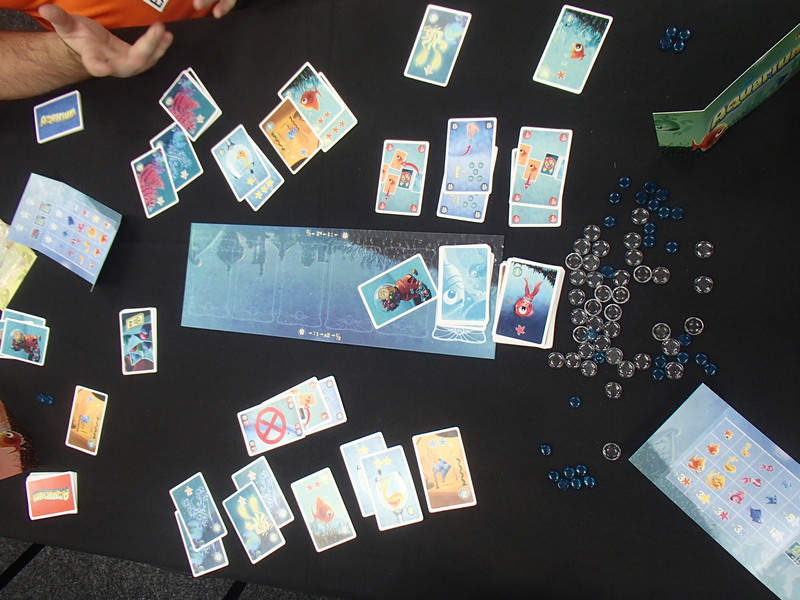 Players are dealt three in secret at the start of the game (thus the expansion works with 4 players.) Completing all three of your missions wins you game. Finally, the Heroes pack contains more heros (duh!) Expect the official release to occur in November-ish. The new “realms” game coming up is Hero Realms. 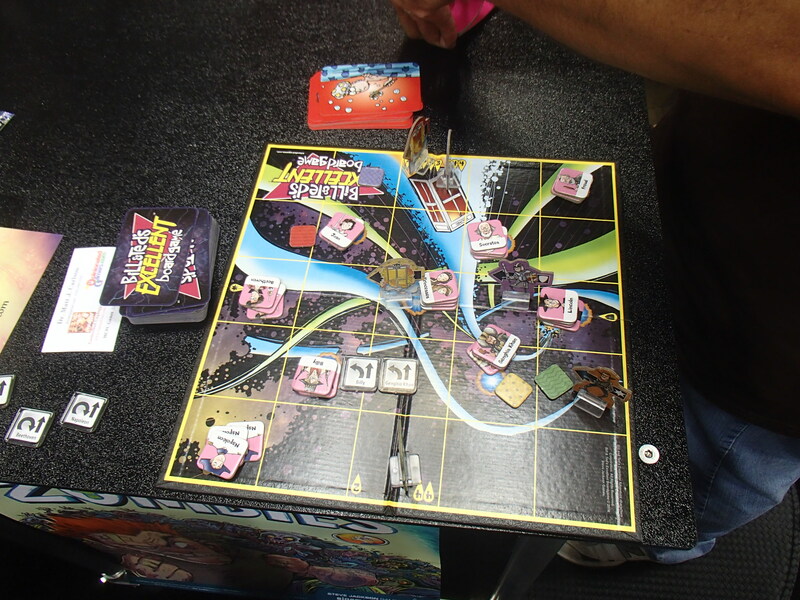 It is a complete game for up to 4 players (rather than the 2 player starter from Star Realms.) There are many similarities to Star Realms. Bases are now Champions (persistent cards that can be attacked.) Outposts are now Guards (you must attack them first.) The significant new mechanism is the idea of tapping cards for powers. Cards typically have an ongoing feature and a feature that can only be used once (by tapping) and then must be reset (by untapping.) Tapped cards will still count for triggering ally abilities. Cards are untapped at the end of a player’s turn (so they could, in theory, be used up before one’s next turn.) The code words “Stun” and “Sacrifice” cause a card to be discarded and removed from the game respectively. Starting hands are slightly more powerful, as there “2” value cards as well as 1’s for money and damage. There will be special character decks for sale that give players a unique starting deck. 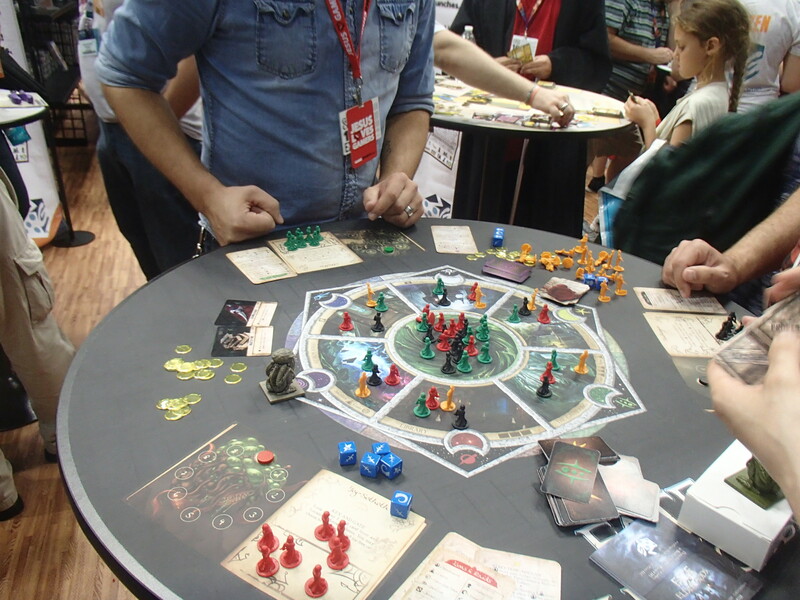 A campaign mode allows players to play from scenario to scenario, upgrading their deck from play to play. I recently had a chance to play Merchants & Marauders and found it enjoyable (although I was somewhat ineffective.) Merchants & Marauders: Broadsides shares the setting but it is its own game. It is a 2 player game. 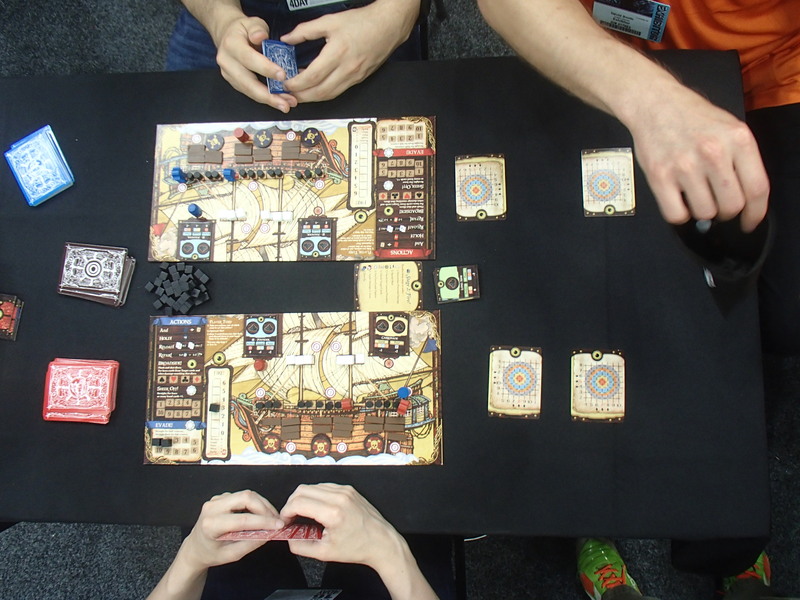 Each player has a boat and uses poker hands (from a standard card deck) in order to operate their ship. Various hands are needed to aim, repair, and shoot. Shooting involves the use of special card displaying a grid over a target. The attacker then tries to create a pair of cards that match the column and row of the center (at least as close as possible.) The defender tries to do the same to avoid the hit. Damage can hit the boat or its sails. Players have a starting character with some abilities. There are additional special power cards which can be purchased by spending the correct poker hand. Hey, there’s an expansion to Tragedy Looper called Tragedy Looper: Cosmic Evil. 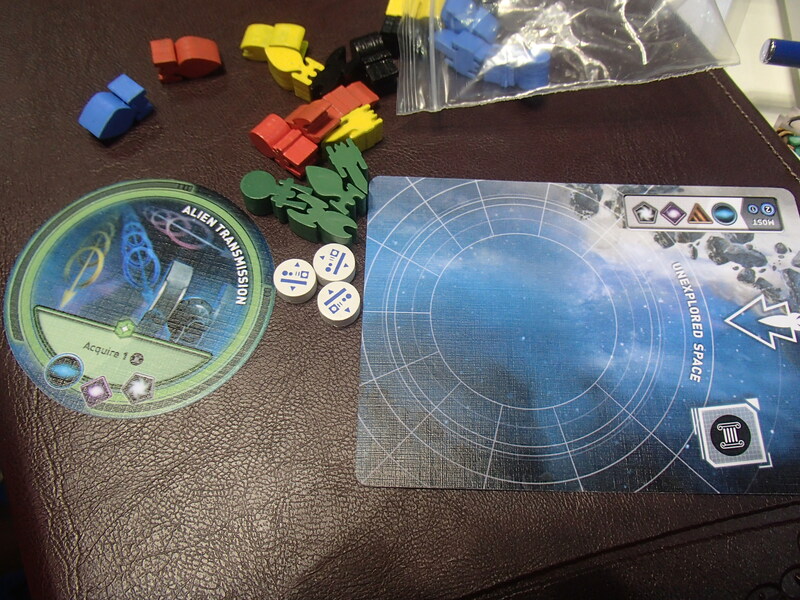 It is the second expansion to the Cosmic Evil game and contains new scenarios. That’s all I’ve got, sorry I can’t be everywhere. Everyone is comparing Beyond Baker Street to Hanabi. 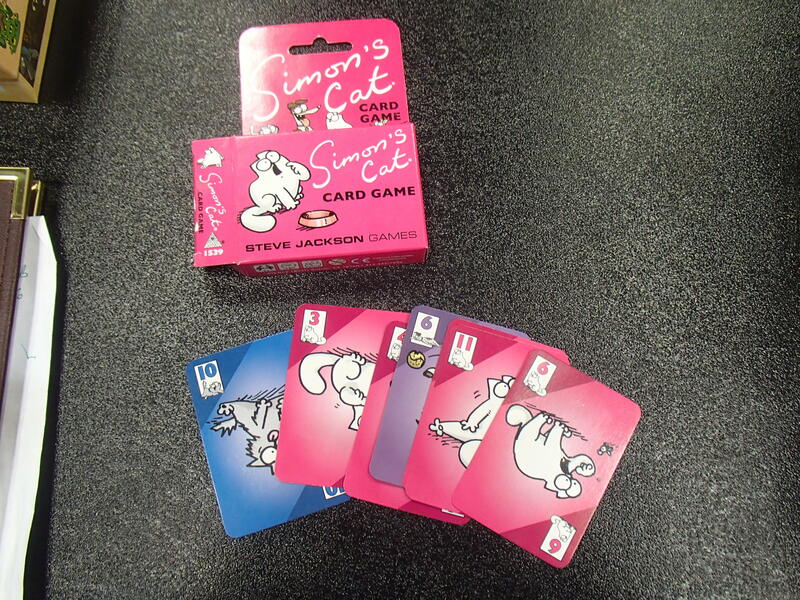 It is a cooperative game where players are not allowed to see their own cards. Players are trying to solve a mystery before Sherlock Holmes does and takes all the credit. Players give each other hints about their cards (color or number) and every time a hint is given, Homes moves closer to solving the case. Players have to play their cards into the correct color piles to accumulate a needed total. If players mis-play the totals needed increase, making the situation harder to achieve. In any given game (there are variations), not all the colors will have a central pile. The unused colors can be played in a separate stack to finish a different task. Characters (players) have special powers which can help or hurt the gameplay. For example, one player may not ever be allowed to say “blue”. There are 15 different ones so even games with the same central setup will be different due to the different characters involved. Right off, I was informed that Aquarium is not a family game (expect it to be a tad more complex.) I could see that it might be misleading as the art is very nice and inviting. 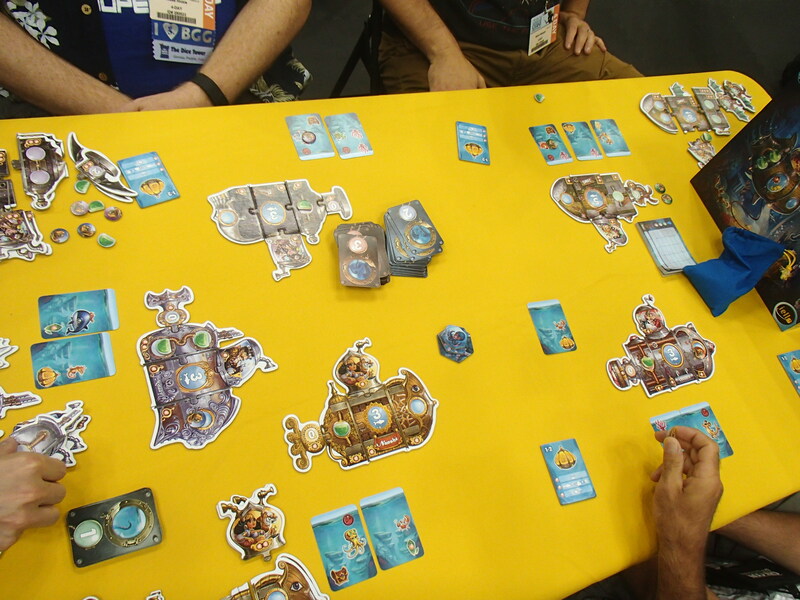 Players are competing to build the nicest aquarium through set collection. There are three versions of each fish and at the end of the game you score points for having a sequence or for having four of a kind. The central board is the fish market. A players can add fish to the market (or not) and then declare a buying round and name the price. Everyone is then able to play special cards to affect the current price. Once the price is settled, the player can decide to buy or not. Along the way, players must also feed their fish (with the cash used in the market.) There are special plant cards that are an ongoing supply of food for one fish. Again, the game looks somewhat straightforward, but I think the game will play best with experienced players who can manipulate the market with an eye toward long term goals. You (and I) have made it to the end of my gaming reports! Yay! Tomorrow I throw up some photos of the strange and weird I encountered at the convention, but that’s all the gaming news I have to share! This entry was posted in Convention Report and tagged GenCon, gencon 2016, Haba, Mayfair Games, reviews, Stronghold Games, Z-man, Z-Man Games. Bookmark the permalink.